Santa Barbara, CA -- Oct 10, 2018 -- Today, WorldViz, a global provider of virtual reality (VR) solutions for businesses and universities, announced that it has launched VizMove 2.0, an expansion of its scalable, certified VR solution for enabling large-scale, location-based or remote VR experiences. VizMove 2.0 is available starting today at www.worldviz.com. There are two main components to VizMove systems: software and hardware. On the software side, VizMove 2.0 comes with Vizible, WorldViz’s no-coding software for drag-and-drop VR creation and collaboration; or Vizard 6, WorldViz’s latest Python-based VR development engine. The hardware is defined by the client’s needs but can include WorldViz’s warehouse-scale motion tracking system, backpack VR units, projection VR displays, eye-tracking, biofeedback monitors, and dozens of other peripherals. HTC Vives, Oculus Rifts, or WinMR headsets, as well as the Unity and Unreal game engines, are all supported. Support for laser-phosphor-based projection instead of traditional light bulbs, resulting in a longer lifetime (20,000 hours) and no decay. 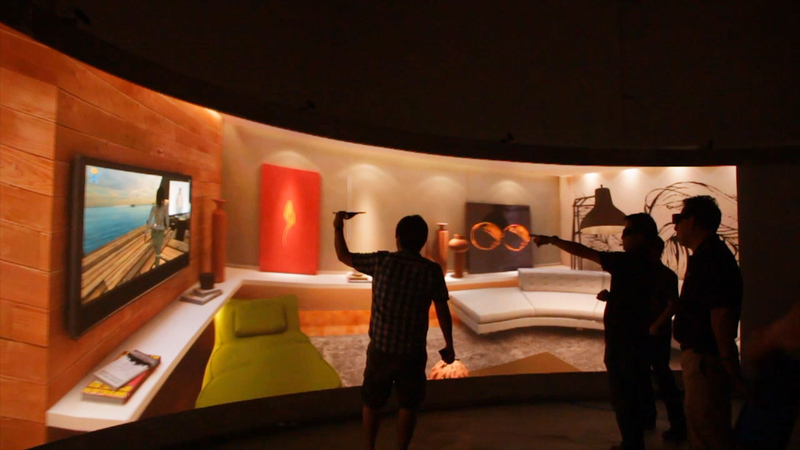 Showroom VR - VizMove VR provides unprecedented immersion for warehouse-scale, collaborative experiences. It can be configured with multiple 3D projectors for various levels of immersion, from single-wall to multi-wall setups with flat and curved options to seamlessly fit local requirements. It can include VR headsets - one used by the lead client for VIP experiences, or one by the presenter to a group watching the presentation via projection. Trade Show VR - Trade Show VR is designed to captivate trade show audiences on a show floor. Depending on booth size and showcased content, trade show VR typically mixes VizMove VR components with specific items like local networking between multiple users and specialized or branded content. R&D VR - In R&D settings, VizMove VR includes everything you need to craft immersive experiments using a wide array of data inputs. Because it is modular and customizable, it can deliver scientific-grade data output with a top-of-the-line selection of input and output devices to choose from. Remote VR - VizMove VR can be configured as a rugged, all-in-one travel-ready VR system with remote connection capability, enabling immersive, next-generation communication in VR while saving travel time and cost. It comes with WorldViz’s patented, turnkey VizBox that lets anyone get into immersive VR hassle-free in less than three minutes, and with Vizible, WorldViz’s VR SaaS solution for remote business collaboration and communication. For more information on VizMove VR 2.0 and/or the pre-configured solutions, please visit www.worldviz.com or contact WorldViz today. Based in Santa Barbara, CA, WorldViz is an industry-leading provider of virtual reality (VR) solutions for the enterprise and public sectors. Its patented VR products and solutions are deployed across 1500+ Fortune 500 companies, academic institutions and government agencies. Backed by Intel Capital, WorldViz’s core products include Vizible, a communication solution for sales professionals, Vizard, the premier development platform for professional VR application design, and VizMove, the world’s only enterprise-class VR software and hardware solution. WorldViz also offers a high-precision “warehouse-scale” motion tracking system called PPT, and professional consulting and content creation services. WorldViz products and services help businesses solve real-world challenges in areas such as sales, product design, education, training, marketing, consumer research and many others. For more information, visit www.worldviz.com. © 2018. WorldViz Inc. All rights reserved. “WorldViz” and "Vizard" are registered trademarks of WorldViz, Inc. All other trademarks are the property of their respective owner(s).